Sorry... the 2017 Mitsubishi Mirage G4 is no longer being sold as new. Instead, take the first step to a great deal on 2019 Mitsubishi Mirage G4 with a free price quote! 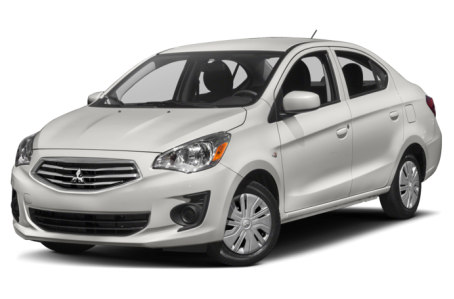 The 2017 Mitsubishi Mirage G4 is the all-new sedan version of the Mirage hatchback. It competes with the Nissan Versa Sedan, Chevrolet Sonic, and Ford Fiesta. Two trims are available: the ES and SE. The Mirage is a cute little 4-door with conventional styling. The front-end has triangular headlights, a hexagonal chrome grille, and a smiley fascia. The rear-end has a chrome strip and badging for an eye-catching glance. Power side mirrors with turn signal indicators come standard. Front fog lights are also available. The Mirage G4 is powered by a standard 78-hp, 1.2-liter 3-cylinder engine mated to a 5-speed manual transmission or a continuously variable automatic transmission (CVT). Fuel economy for the Mirage manual is 33/40 mpg city highway. It improves to a 35/42 mpg rating for the Mirage CVT. Inside the Mirage G4 has a new black interior with fabric seating. The center console features a standard audio system, which includes a CD/MP3 playback and a USB port. It can be upgraded with a 6.5-inch display, Apple CarPlay/Android Auto compatibility, and Bluetooth connectivity for phone and audio. Standard features include air conditioning, power windows/locks, power front seats, and remote keyless entry. Available features include a leather steering wheel, a leather shift knob, heated front seats, dual-zone automatic climate control, cruise control, and an automatic dimming rearview mirror. Standard safety features include front airbags, antilock brakes, an electronic stability system, and a tire pressure monitoring system. A backup camera is also available. 22 of 24 (91%) consumers said they would recommend this vehicle to a friend.